If you've read my book Play Like a PIRATE: Engage Students with Toys, Games, and Comics, you know that I'm a big fan of Sesame Street. I like how the creators of the series were able to combine education and fun, and took a lot of those lessons into my own classroom. Another thing that I didn't touch on in Play Like a PIRATE is that Sesame Street was my first introduction to a lot of people that were different from me. That included skin color, different languages, and different abilities. I "met" Linda Bove's deaf character before I ever met a deaf person in real life. I saw both Stevie Wonder and Ray Charles perform before I had ever met a blind person. I saw Itzhak Perlman using crutches before I met anyone else who needed them. Sesame Street hasn't ever shied away from challenges, and they've just introduced a new Muppet character, Julia. Julia has autism, and as an educator and father, I don't think there's a better time to introduce someone new to our students and children. While there's a media blitz this week about Julia (she was on CBS' 60 Minutes last Sunday)(and you've probably seen multiple news stories about her), the need for a character with autism and the way to handle her has been a process that's taken years to develop. She was introduced in books and animated media about a year ago, but is making her formal debut on an episode of Sesame Street on April 10 on HBO. 1. They've made Julia "one of the gang." She's most often seen with Abby Cadabby, and it seems like they're becoming fast friends...but we also see her with Elmo and Big Bird and Alan and other characters. She's not in isolation, but one of many different friends on the Street. She may be "on the spectrum," but she's also one of us. She's only in two episodes this season, but will be in more next season. 2. They're not sugar coating it. Autism disorders are in a spectrum from mild to severe. As a teacher, I've had many students with autism, generally at the more mild end of the spectrum, but still needing some intervention, some patience, some understanding. The show creators and performers have given Julia several traits that are common with many children with autism, including repeating phrases, some sensitivity to loud noises, sometimes flapping her arms or hands. Some of the other characters are confused or worried about Julia's behavior, feeling like Julia doesn't like them, or doesn't want to be friends. Other characters who know her (Elmo in an animated segment, Abby Cadabby in live action) act as a bridge, helping explain some of her actions to her other new friends. Introducing a character with autism isn't just to benefit the viewer with autism, but to help kids who aren't autistic recognize ways that they can be friends to those who are. 3. Julia is "Amazing." Sometimes children (and adults) with autism will hone in on one particular idea or talent, and focus on it to the exclusion of other things. I've had students who have been focused on numbers, on books, on history, on animals...for Julia, she has a particular talent for art. She likes art, but also has an extraordinary talent for it. As with the Itzhak Perlman episodes I remember from the 1980s, where Julia may have a disability in one area, she has a lot to offer in others. She also has an ear for music and for words -- but her art is where she really shines. They do use the word "autism" and "autistic" with Julia, but they also call her "amazing," with the idea that all kids can do amazing things, and they're using that adjective to highlight their work for children. 4. Behind the scenes with Julia. 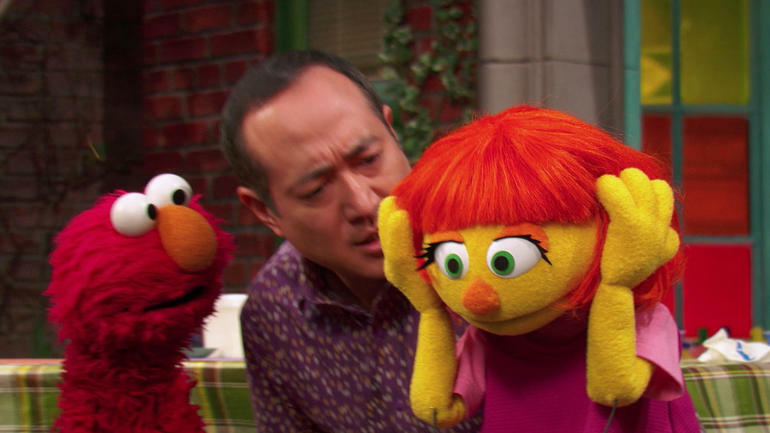 Every character and every storyline on Sesame Street is backed up by hundreds of hours of research and development, but I can't think of many who have gone through such a thorough process as Julia's character has. The puppeteer performing Julia (and present through the creation of the character) is Stacey Gordon, whose son also has autism. Having that first-hand insight into how the character will be portrayed goes beyond the research that led them to this point, and bring new life to Julia with a sensitivity that's key to the character's success. 5. Beyond Julia. 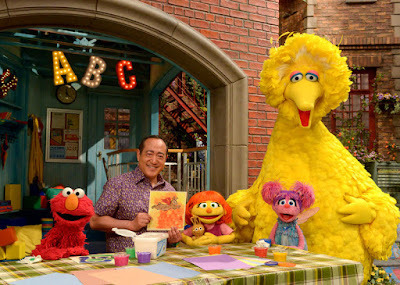 Besides all of the great things that will be happening with Julia on television, in books, and online, there are resources that Sesame Street has been developing for years at http://autism.sesamestreet.org/ . They include videos for kids with Sesame Street characters, storybooks, routine cards, but also extensive resources for parents (and teachers) who are looking for support or strategies to help them teach and love these kids. Julia is in these resources...but they go way beyond what they can do on the show itself. Sesame Street often has "offscreen" initiatives that you don't know about unless...you do. Work for military families, for grieving families, for communities in need. I'm glad that they've taken their autism initiative from these back pages and onto the mainstream Sesame Street...but they do more good off the Street than most people realize. In our classrooms, we need to do more to understand and try do serve the needs of all students. With students with autism, the barriers may be harder to overcome than others. It may not be me (the teacher) who struggles to understand that student, it may be their peers. 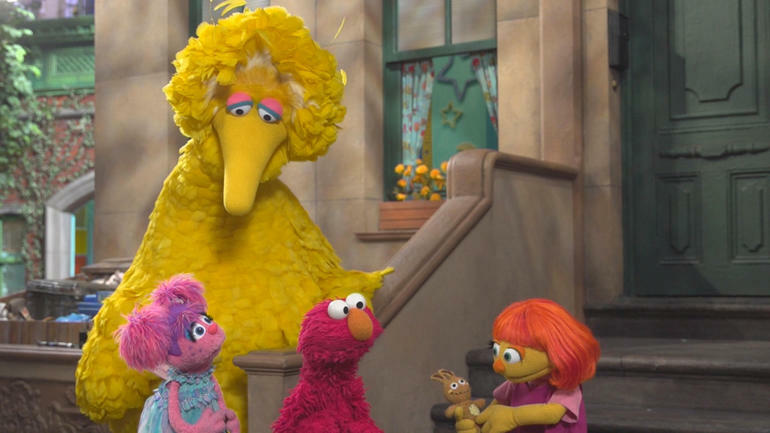 My hope is that with initiatives like introducing Julia onto Sesame Street, kids will become less frightened of students who are different from them, and more eager to reach out, to help, to love them. It will be interesting to see what comes of this new character. I hope to hear more updates from you. This is what I want to find.